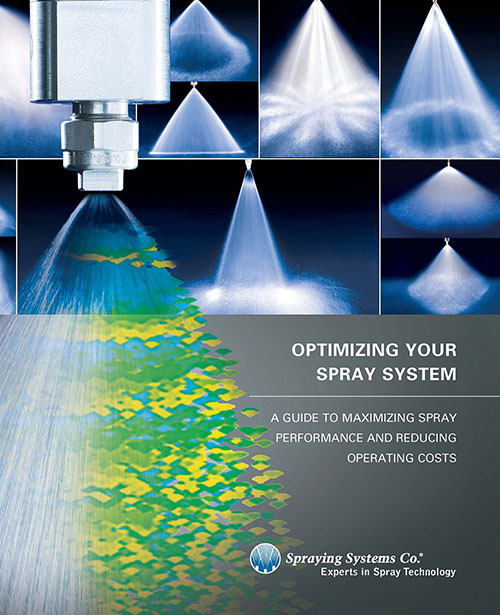 A new spray nozzle educational guide “Optimizing your Spray System” from Spraying Systems Co. explains how to optimize performance and lower costs in cleaning, coating, cooling and lubricating operations using spray technology. The comprehensive handbook, Optimizing Your Spraying System covers the use of spray technology from system specification, installation, operation and maintenance through optimization. The costs associated with using spray nozzles and systems that are not optimized can be staggering. The handbook explains how under-performing spray equipment can often go undetected and cost manufacturers tens or even hundreds of thousands of dollars annually. Readers will learn how quality problems and significant waste of costly chemicals, water and energy can result from spray equipment problems. The handbook provides detailed information on how to detect costly spray nozzle problems that are not usually found during a visual inspection and outlines steps for troubleshooting and resolution. Also included are guidelines and checklists for monitoring and maintenance procedures to help ensure trouble-free, efficient operation. The value of assessing spray nozzles that appears to be operating properly is also addressed. The handbook explains why even small changes in operating conditions may improve performance; how adding a spray controller can improve precision and throughput; and when new spray technology should be considered.